When the dominant Audi Sport Team Joest Le Mans prototype program closed last year, it left only two teams in the world’s top LMP1 class of endurance prototypes. Now Team Joest is partnering with Mazda in a smaller regional series, which would be a step down if LMP1 was thriving. But LMP1 isn’t, and Team Joest’s move is the biggest sign yet that LMP1 must make hard changes in order to survive. Prototypes are cars that are purpose-built for racing. They’re nerd heaven for racing fans, as the top classes feature plenty of cutting-edge technology. Sadly, that technology is expensive to develop. That great expense is why classes of prototypes that don’t let teams change as many items on the cars are thriving, and the world’s most prestigious LMP1 class that leaves development more open is struggling just to keep its two teams around. I wondered how the deal for Team Joest to run a Mazda prototype in the IMSA WeatherTech Sports Car Championship came together, so I spoke over the phone with Mazda’s North American Director of Motorsports John Doonan. 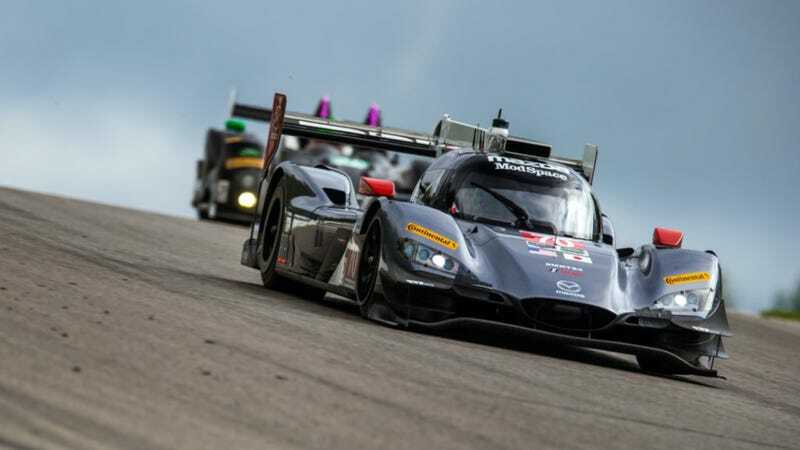 The WTSC is North America’s top series for endurance racing, and Mazda runs a DPi-spec car in the top Prototype class there. Problem is, Mazda’s car kept finding new ways to break, fail or light itself on fire. Racing is a small world, and Mazda and Team Joest had a lot of common relationships that introduced them to each other after Audi announced they would be closing Team Joest’s current Le Mans program. So, Mazda representatives sat down with Team Joest at this year’s 24 Hours of Daytona—the very race where they debuted the RT24-P that was all-new for this year. Doonan says Mazda knew it would be a good fit as both sides understood that they needed to win. Mazda’s been as frustrated with their recent racing record as the rest of us who’ve kept watching their car break down. When they announced their partnership this week, Mazda withdrew from the rest of the 2017 season to let Team Joest focus on upgrading the car, particularly in terms of water and oil cooling, and the aerodynamics of the underside of the car. As exciting as this is for Mazda, it’s hard to imagine Team Joest moving to a strictly North American series if everything was fine in endurance racing’s top global series, the World Endurance Championship. The WEC’s LMP1 class where Team Joest ran Audi’s program is supposed to be the top class of prototypes in the world, but LMP1 is in such a weird holding pattern at the moment that going somewhere else makes a lot of sense. Right now, there are rumors of Porsche pulling out of LMP1 and leaving the class with only one team, and no one is quite sure what will happen to LMP1 if Porsche leaves. No one’s willing to step into Porsche’s place, either, as running an LMP1 team is simply too expensive. You know LMP1 is really struggling when a dominant squad like Team Joest can’t find another manufacturer willing to pick them up and keep going there, either. Yet the WEC also wants to keep LMP1 as the ultimate showplace for emerging automotive technologies—particularly hybrid and electric tech—the likes of which are expensive to develop. When one class is in doubt but another seems to be thriving, it makes sense that Team Joest would jump ship, “move down” or not. The big question is, what will become the top prototype class in the world if LMP1 implodes? The WEC wanted to keep manufacturer-backed teams out of its second-tier LMP2 prototype class, as it was meant to cater to teams that had a mix of professionals and amateurs. Manufacturers drop big money on racing programs and tend to price out true amateurs from being able to compete in their class. While most regional endurance series adopted LMP2's spec as-is for their top prototype class, IMSA developed their own manufacturer-supported DPi spec to run alongside their LMP2 cars. IMSA needs manufacturer cash to stay viable as a series, and marques didn’t want to be locked out of the series’ fastest class of race cars. IMSA’s Prototype class is alive and healthy, with Acura announcing they’ll be the fourth manufacturer alongside Cadillac, Mazda and Nissan to have a DPi next year. Only problem is, IMSA DPis aren’t currently eligible to run at the biggest show in endurance racing: the 24 Hours of Le Mans. Le Mans is a WEC race, which has no place for DPis. Could the weirdo regional DPi spec become a replacement for LMP1, then? The biggest drawback is that the technology isn’t as interesting, but IMSA’s class is thriving. Perhaps there’s a middle ground between DPi and LMP1 that could give the WEC some of the future-tech fans want to see without leaving the cars so open for development that no one can afford to run there. Doonan is hopeful that IMSA and WEC will come up with common regulations someday that would allow Mazda Team Joest to run at Le Mans or even in a global championship. But that’s still an unknown, so they’re focused solely on winning the North American championship for now. Team Joest’s move down may point out a bigger problem with the current world championship for endurance prototypes, but it also makes the answer to WEC’s woes even more clearer. Get costs under control for your series’ top class, and top talent will follow out of necessity.